The good chickens over at Henery Press kindly sent me an advance reader’s copy of Whack Job in exchange for an honest review. As per usual with this publisher, the pleasure was entirely mine. Generally speaking, I read more than one book at a time. The obligatory nonfiction and relevant-to-The-Day-Job pick that I make my way through while in my cubicle. The Diana Gabaldon tome from the Outlander series that I tackle one chapter at a time. The book that I started reading on my Kindle app while waiting for some appointment somewhere. And then the “main book.” The book that is next in line in my reading queue for review. Kendel Lynn’s Whack Job knocked all of the other books out of the water and enticed me to pay full attention to it and only it. 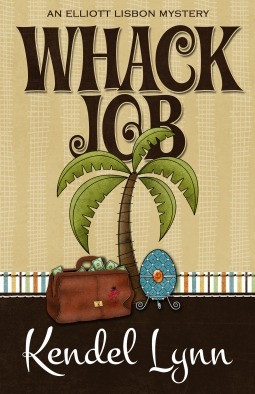 Whack Job is the second book by Kendel Lynn featuring Elliott Lisbon. The series is set in South Carolina and is narrated by the immensely likeable Elliott. She’s the director of a charitable foundation and is also working toward earning her Private Investigator’s license – both jobs seem to offer her ample opportunity for adventure and (to the reader, at least) hilarious mishaps. Easily and by far one of my favorite books of 2014 and certainly a contender for a spot on the ever-more-crowded bookshelf. Wow Jenna, this sounds good!